POOR ORAL HYGIENE HABITS. 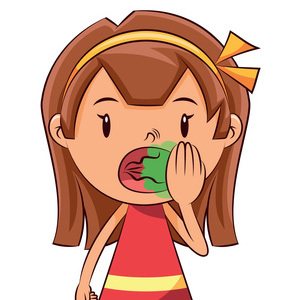 Bad breath often results from bacteria on the teeth and tongue that is not effectively removed during brushing and flossing. Tip: To encourage thorough cleaning as children are developing their oral hygiene habits, try handheld flossers that are colorful and easy to use, sing or play music to make brushing time fun, or try an electric toothbrush with a timer or a tooth-brushing app that keeps kids brushing for a full two minutes. PLAQUE BUILDUP, TOOTH DECAY AND GUM DISEASE: Plaque, a sticky bacterial biofilm, can build up on tooth surfaces, between the teeth and under the gum line and can lead to tooth decay and gum disease. These conditions may result in bad breath. Tip: Stay on top of your child’s oral hygiene at home, and keep up with regular dental visits for professional cleanings and checkups. POST-NASAL DRIP: This common cause of foul-smelling breath in children results when excessive mucus is produced and drips down the back of the throat. Tip: Schedule an appointment with your child’s pediatrician to determine and treat the cause. MOUTH BREATHING. Breathing through the mouth instead of the nose can cause a dry mouth. This can lead to increased oral bacteria, which can cause bad breath. If children breathe through the mouth all the time, not just because of a temporary cold or allergies, your child is at greater risk for tooth decay and gum disease. Tip: If your child is a chronic mouth breather, schedule a dental visit so we can check for any adverse effects on dental health. Note that over time, habitual mouth breathing may lead to poor alignment of the teeth. An ear, nose and throat (ENT) specialist can treat problems with tonsils, adenoids and sinuses — common causes of mouth breathing. FOREIGN OBJECT IN THE NOSE. It wouldn’t be the first time a child has stuck a pea or other small object up their nose â?? or their sibling’s nose — only to find that it won’t come back out. A foreign body in the nasal passage can cause infection and lead to bad breath. Tip: Don’t try to remove the object at home, as part of it may remain in the nasal passage. A medical professional will have the right equipment to dislodge the object more comfortably. MEDICATION. Children who take antibiotics for a long time may develop a fungal infection (thrush) in the mouth. Other medications can cause bad breath due to the way they break down in the body. Tip: Call your pharmacist if you have a question about medications and bad breath. MEDICAL CONDITION. Infections of the throat, sinus or tonsils can cause bad breath, as can more serious health conditions. Tip: If your child’s breath is unpleasant for an extended period of time, get it checked out by a health professional. If you are concerned about your child’s breath, schedule a visit. We are happy to remind your child of proper brushing techniques and check for other problems that need to be addressed.